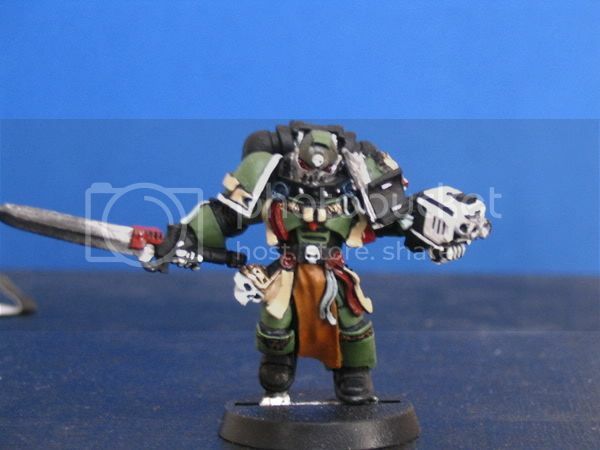 heres the squad leader of my grey knight&#39;s. i dont play deamon hunters but i liked the minis and so now they are dark knight&#39;s, i think that htey are gonna be azrael&#39;s body gaurd. tell me what you think, and do you think the white storm bolter and hands are to much? I think it&#39;s totally fine as it is. However, I do think that the white of the storm bolter draws a lot away from the rest of the mini, but really it&#39;s fine. I think the colours work really well on this figure, especially with the intent that they be part of a Dark Angels army. Very sombre and also a good clean finish. No matter how well a figure is painted if the colours do not work the figure does not work. What I think will really finish the figure off perfectly is the base, I do not know what you have planned but I am sure it will rock. thnx jesta i think im gonna do the top of the pack in white as well and change the color for the rest of the squad. this guy in nowhere near done yet, the rest of the squad&#39;s progresion is about the same. I am rushing on the figures i have because im getting a shiteload of tau in mail this week. these guy&#39;s are real important to me thogh so i am taking my time(about three weeks) with them. i see the white hands as wing&#39;s i guess was my original idea but I agree that they detract from the rest of the mini,the ribbons in generral. the eyes of this mini are stop light red from testors and sparkle darker than blood red, i havent been able to get a pic of it because of the reflective quality of the silver jaw area which is kind of the only part of the original scheme i kept. whoa, that was a speil! haha! hmmm that was kinda my original idea for the inner part of the helm, to bring out the red eye effect. the weathering on the sword is my finger&#39;s by the way, i like to paint the blade first and then handle it for the duration of the painting process. some times the technique looks really good and i&#39;l leave it, sometimes it need&#39;s alteration. i havent done the pack&#39;s or the back of the torso yet, and the other four sets of hands and guns are still black. i am gonna think about the white helm thogh thanks again for the input fellas. I think the armour needs more highlights, and the gun needs more shading, but that looks like a very good model, although not quite finished yet.